As part of our 120 anniversary celebrations this year, the Music Festival video and the Celebration of the Eucharist music recordings are available for purchase. 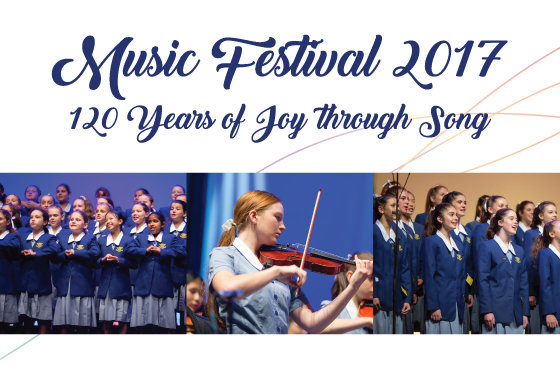 We commissioned a professional video recording of the 2017 Music Festival and professional recordings of the musical parts of our 120 Years Eucharist, which features music from all parts of the liturgy and showcases the talents and gifts of our staff and student musicians. It also includes ‘Felicity’ by Katie Hardyman, Class of ’88. The Music Festival Video and Celebration of the Eucharist Music Recordings are available for purchase by following this link. You will note there are options to have the video and/or music recordings delivered to your home or sent home with your daughter. The Music Festival Video and the 120 Years Eucharist music recordings are a joyful way of reliving the beauty and vibrancy of two very special 120 Year celebration events.